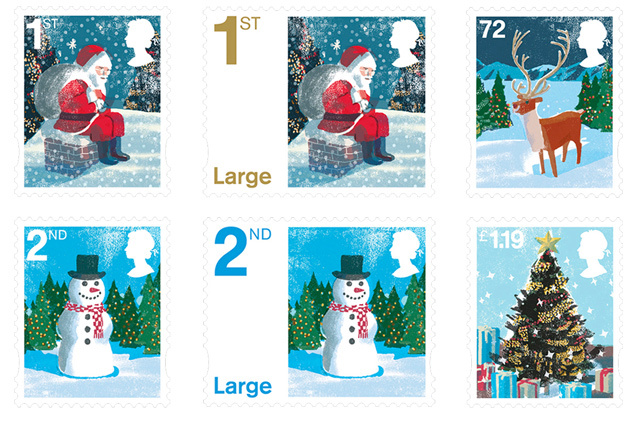 This year's Christmas stamps feature secular designs of Father Christmas, a Snowman, a Reindeer and Christmas Tree. Because of the introduction of <="" a="">Pricing in Proportion this year's stamps include two each for 1st class and 2nd class. 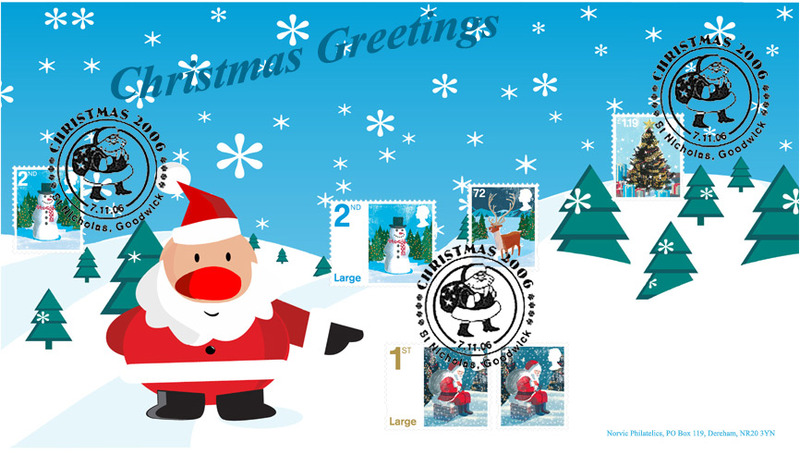 The 2nd class stamp is illustrated with a Snowman, the 1st class with Father Christmas sitting on a chimney, 72p shows a reindeer, and £1.19 has a decorated Christmas Tree surrounded by presents. The stamps feature illustrations by Japanese digital illustrator Tatsuro Kiuchi. He works in Adobe Photoshop and calls his work digital printmaking. “The brief for the stamps was very open”, explains Tatsuro. “I was asked to come up with some sketch ideas on a Christmas theme which would incorporate the graphic and print-like quality of my work.” This resulted in a series of instantly recognisable symbols of Christmas.“Even though many Japanese people are not Christian, Christmas is quite popular in Japan,” he continues. “Christmas Day itself is not a holiday. Some people go out for dinner with their friends and families, but I usually work. New Year, which we celebrate on the first three days of January, is much more special to Japanese people, and that is our holiday. However, I have worked on the Christmas theme a couple of times before.” This has been mostly for magazine and book illustrations published in Japan. Formatted by CDT Design and Rose Design, the stamps have been designed by Tatsuro Kiuchi, and printed by De la Rue Security Print in gravure. The small stamps are definitive size - 20 x 24mm - and the Large Letter stamps 30 x 24mm. The stamps will be die-cut on the self-adhesive sheets. 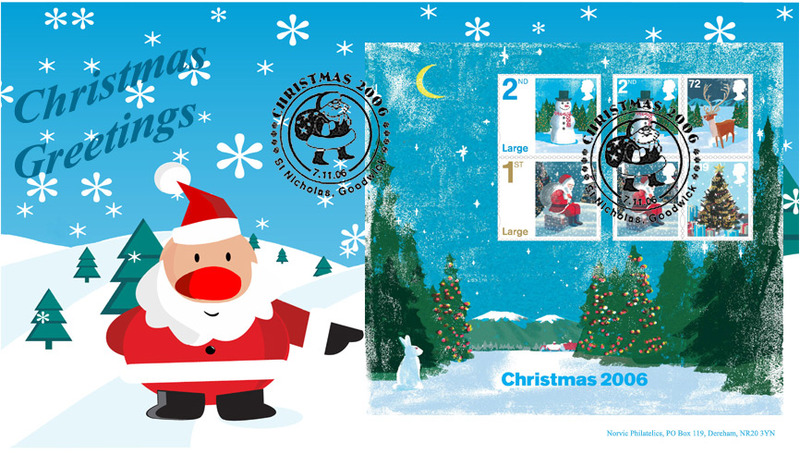 As the stamps are definitive-sized, the Christmas stamp booklets will be the same size as definitive books of 12. The 1st class stamps have red covers and the 2nd class blue covers. On booklets seen today, there are no cylinder numbers, the edge strip has winter scene colouring, in the same way that the Greetings/Smilers booklets have stripes. The 115x102mm Miniature Sheet will be conventionally gummed. 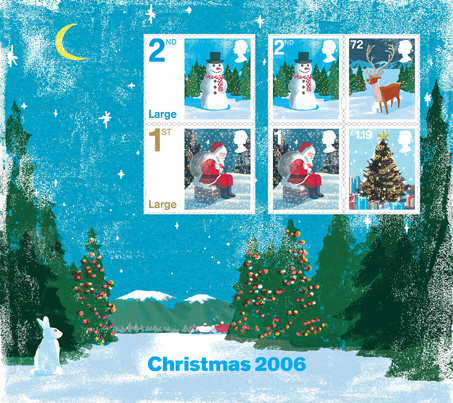 It contains the six stamps, arranged as a block of 4 and a pair, against a Christmas Landscape background by Tatsuro Kiuchi. The generic self-adhesive Smilers sheet was designed by Rose Design and comprises 20 stamps: 10 x 1st Class and 10 x 2nd Class set within a border and labels illustrated by Tatsuro Kiuchi. This background features a snow scene in the park together with illustrations of children and adults, snowflakes and an image of a steam train passing below the hills. The Smilers sheets are printed in litho by Cartor Security Printers. Click on the image for a larger one in a new window. Post Office FDC with a full set or miniature sheet - £5.25 with any postmark if ordered by 4 November. For all enquiries, or if you would like to be contacted when this page is updated please email us.